I had never been accused of being a prodigy-of-letters, blazing across the literary firmament, my brilliant prose eliciting gasps of wonder and awe from critics and the public at large. Mmmmmno.. There were days back in my shallow youth, though, when I actually thought I had a shot at modest success, if not the pinnacle of Pulitzer-crowned fame. After all, wasn’t I covering all the right career bases? 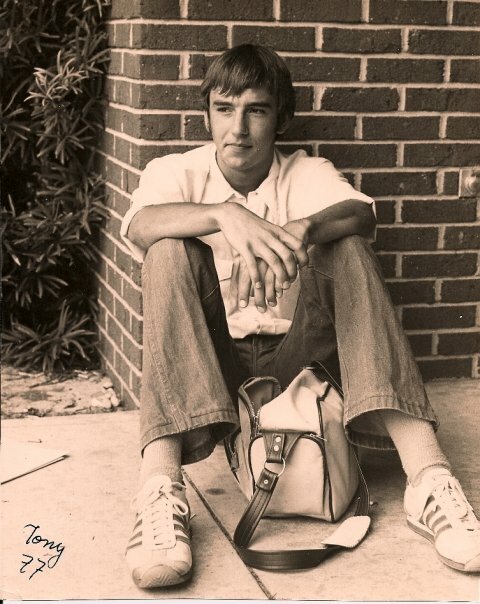 For starters, as a journalism major in college, I had worked my way up the ranks of the campus newspaper from photographer to photo chief to editor-in-chief. I was running a weekly newspaper! I wrote the editorials! Fraternities actually courted me to join! 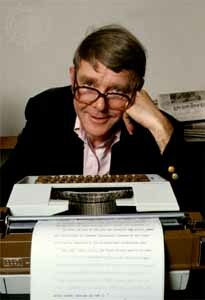 Besides that, I was reading the columns of Russell Baker, a journalist’s journalist, a writer with a keen eye, a sharp wit, and a pen that could make any politician’s political sword fall limp and useless. I wanted to be like him, and so I read his words and tried on his wry, witty and wise writing style as if it were a warm and well-worn tweed jacket that would give me magical writing powers. Success-by-osmosis: I was certain that was possible. 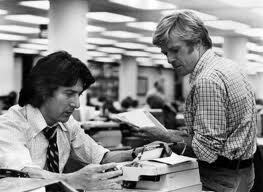 And like all journalism students of my generation, I also wanted to be like Dustin Hoffman and Robert Redford in All the President’s Men. Dashing, determined, brash, principled. Saving the world by slaying one corrupt administration at a time. No, wait: that was Bob Woodward and Carl Bernstein. Anyway, my early success in college had led to a paid summer internship at the local daily, The Orlando Sentinel. I admit that this exciting opportunity did not get off to a sterling start. On my first day, an editor sat me down at the Metro desk, in front of a computer I did not know how to operate, and told me to transcribe the story (on deadline!) of a reporter speaking on the phone. Did I mention that my typing speed was about 18 words per minute? I was petrified. But I hunted and pecked my way through this trial-by-fire as best as I could, filling the article with so many typos it looked more like Hungarian than English. I thought that once the by-now-exasperated reporter was done dictating, I could clean up my copy and my first-day reputation could remain unsullied. But no. “I need that story now!” the editor ordered. I was mortified. After looking at my horrible typing job, I was sure there would be snickering, sighing, and tut-tutting behind my back. And perhaps my journalistic career would come to a quick and merciful end. But the editors were generous and kind and understanding. They gave the skinny college kid a second chance. And a third. And a fourth. By the ninth chance, I was doing all right. I even ended up on the front page! It was a story about a woman who gave birth in a car on the way to the hospital. I was there at the Metro desk when one of the editors took the tip for the story over the phone. “Interns awaaay!” she said. At summer’s end, I returned to UCF to complete my studies. By this time I had finished my requirements for a journalism degree, and was taking all history courses, so I could also have a major in that subject. Why? I wanted to study history in grad school, to challenge myself intellectually, to make myself better qualified to write about the world. As my graduation approached, I heard from the editor who had supervised my internship. She and her colleagues had thought enough of my work to offer me a job at one of the Sentinel’s exotic, far-flung bureaus — in Volusia County. I was flattered, and feeling somewhat vindicated after my shaky start. But by that time I had already been accepted at Georgetown, where I would study Middle East history. So I walked away from my chance to start out as a cub reporter and end up who-knows-where? But I had my sights set on bigger assignments than New Smyrna Beach City Council meetings. With my MA in hand, I thought there would be nothing between me and a bright future as Time magazine’s Cairo bureau chief. Or so I thought. I had begun to write this blog entry after reading an obituary a couple of days ago. It was the life of a woman who was herself a late bloomer, and her life reminded me a bit of mine. But as you can see, I got sidetracked. I’ll get back on track tomorrow. Or the day after.. The story of how longer works of literary non-fiction are migrating from old-school printed media to new-school ones online continues to trend. David L. Ulin, book review editor of the Los Angeles Times, adds to the growing body of articles on the subject with this nice summary. He talks about Byliner and the Atavist, which I’ve already blogged about. But he also notes that the Virginia Quarterly Review has a fairly recent but growing online presence. I’ve also blogged about longreads.com, and now comes a piece by Paul Farhi of the Washington Post with some more details about the site. Here is a long post, quoting an email Beverly sent me a few weeks before she died. It contains a detailed description of the memorials she created for Sean. One of the great, great things about this digital transformation we’re going through is the amazing increase in interactivity. People can be in touch with others who are literally on the other side of the globe, in a number of ways. Question: Taking this poll [about life, death, and God] was interesting for me because I recently had a recurrence of the cancer I beat last year and now it turns out that it’s likely terminal. I’m 31 years old. I was never baptized, not raised in a religious home, etc. And I still don’t know what to believe, even when confronted with my impending death at a time when I was not expecting it. I used to think people who turned to religion as they were dying were copping out, but I’m starting to understand it a little better now. But I still don’t know what, if anything, to believe. GENE WEINGARTEN : When I was 40, I was where you were: Facing likely death, and doing it as an atheist. In my case, I tried to make myself feel better any way I could. I did research, learned that in the year 1012, the average life expectancy was 29! I was already waay ahead of the game! I started reading the obituaries, and took solace from anyone who died younger than me. It’s gruesome, but a school bus crash filled me with joy! In short, I dealt with it all like a smartass. We are what we are. Don’t change who you are. But I do have some helpful advice for you, too. There’s some small validity in that Socrates notion. Nothing is “copping out.” It is the nature of life, and the signal strength of the human animal, to adjust our thinking as we learn new things. You are, philosophically, in a fertile place to learn. You are being forced to face great questions earlier than most of us do. Use that opportunity wisely. If it leads you to faith, that is not a bad thing, nor is it, necessarily, an accommodation with yourself — a concession to fear. It can represent a higher state of philosophical awareness. And lastly, I want to tell you that I am still here, 20 years later. Doctors are not always right. And the philosophical contortions I went through 20 years ago have helped me better order my life since. In retrospect, I feel as though I’d been given a gift. You may be, too. This article by James Rainey captures the power of the oral histories collected by StoryCorps, and the special drama and personal poignancy of Beverly Eckert’s story, before 9/11 and after. It is the place where nearly three thousand people perished one September morning, and many others were injured, sickened and emotionally scarred. For the loved ones left behind, the place where the Twin Towers of the World Trade Center once stood so very tall became the most hallowed of grounds. To properly preserve that space, and to erect a memorial that would honor the dead and inspire the living, became a cause very close to the heart of Beverly Eckert and other 9/11 family members and friends. It was the last place on this earth where so, so many took their final breath. It was where Beverly’s husband, Sean Rooney, said his goodbyes. 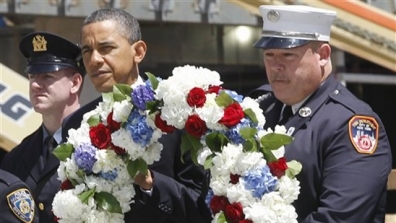 There was news about Ground Zero this week, and it wasn’t just about the president’s visit. The National September 11 Memorial and Museum announced that the memorial was complete and ready for visits — at least digitally. The 9/11 Memorial web site allows visitors to search for the name of a person to see where it will appear on the real memorial. There are digital renderings of the entire memorial/museum complex, as well as illustrations showing all sections of the memorial inscribed with the names of victims. Even from this relatively cold and distant artificial perspective, the memorial is a moving place to visit. And its design was strongly influence by the concerns of Beverly and other loved ones of the departed. But at one time, there were conflicting visions about Ground Zero’s future. After 9/11, everyone agreed that the place where the towers fell was special, and that there should be a memorial built there. But in the months that followed, views diverged on how the site should look after the debris had been cleared, the remains sorted, and construction completed. The bigwigs in government and business had in their sights one of the most potentially lucrative pieces of real estate in Manhattan. Sure, they recognized the need to be sensitive to the site’s new significance, but often their vision was dominated by dollar signs. 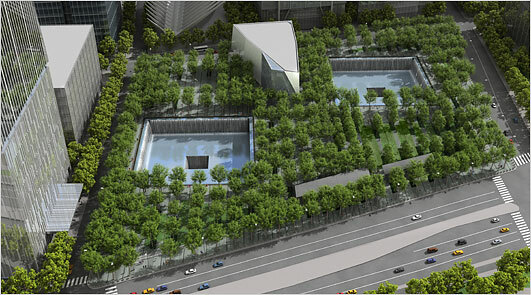 Ground Zero, after all, was hard by Wall Street, which is not noted for its sentimentality, the softness of its heart. So when re-development of the hallowed ground began to move forward, clashes broke out between the various interests. Beverly was among those who opposed plans by the site’s developers to have a relatively small memorial, and to build on top of the bedrock upon which the towers stood, and upon which they fell. Beverly and other family members wanted to whole site to be preserved “down to the bedrock.” She felt that covering it with train stations, roads and buildings would erase the very heart of 9/11, would diminish the quiet solemnity of this final resting place for so many. Beverly and the other opponents of the developers were small in number, but they were committed to their cause. As the second anniversary of 9/11 approached, Beverly and others felt the situation had come to an impasse, that the developers were moving forward with their own plan to bury most of Ground Zero in buildings and transportation infrastructure. Beverly planned to lock arms with others at the main gate of the Ground Zero construction site, blocking any workers and their equipment from entering. She was dead serious, so prepared to be arrested for this act of civil disobedience that she consulted with a lawyer about how to go about the protest, and how to behave once arrested. Beverly and other protesters arrived at the appointed place on September 3, 2003, but the gate was locked. After hearing about the planned action, the developers decided to have workers and vehicles use another entrance to the site. Still, Beverly was able to get her message out, and the story got wide coverage. Eventually, a new plan for the redevelopment of the site was drawn up, which took into consideration the wishes of the families and friends of those lost. 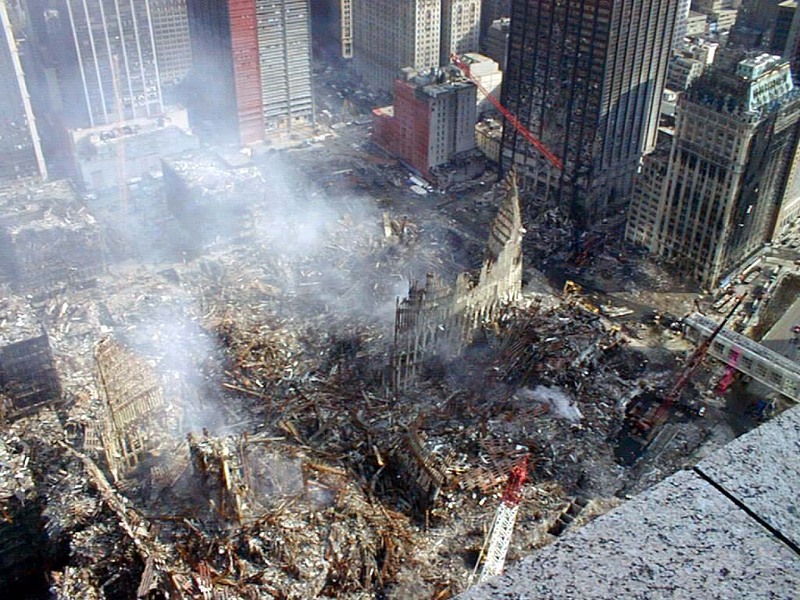 The footprints of the Twin Towers were preserved, becoming, in fact, the dramatic centerpiece of the memorial plaza at Ground Zero. Beverly and her allies had won another victory, and their vision of how to honor and remember those who died on 9/11 will stand for many, many years to come.